A 1965 RAF 25th Anniversary first day cover, originally autographed by Battle of Britain Legends Sir Hugh Dowding and Sir K R Park. 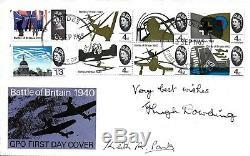 The item "Hugh Dowding & Keith Park Battle of Britain Hand Signed 1965 FDC RAF Cover" is in sale since Friday, March 16, 2018. This item is in the category "Collectables\Autographs\Uncertified Originals\Military". The seller is "khc1927" and is located in Shipley.